Marshall RD, Beebe KL, Oldham M, et al. Efficacy and safety of paroxetine treatment for chronic PTSD: a fixed-dose, placebo-controlled study. Am J Psychiatry. 2001 Dec;158(12):1982-8. Simon NM, Connor KM, Lang AJ, et al. Paroxetine CR augmentation for posttraumatic stress disorder refractory to prolonged exposure therapy. J Clin Psychiatry. 2008 Mar;69(3):400-5. Tucker P, Zaninelli R, Yehuda R, et al. Paroxetine in the treatment of chronic posttraumatic stress disorder: results of a placebo-controlled, flexible-dosage trial. J Clin Psychiatry. 2001 Nov;62(11):860-8. Connor KM, Sutherland SM, Tupler LA, et al. Fluoxetine in post-traumatic stress disorder. Randomised, double-blind study. Br J Psychiatry. 1999 Jul;175:17-22.Meltzer-Brody S, Connor KM, Churchill E, et al. Symptom-specific effects of fluoxetine in post-traumatic stress disorder. Int Clin Psychopharmacol. 2000 Jul;15(4):227-31. Martenyi F, Brown EB, Zhang H, et al. 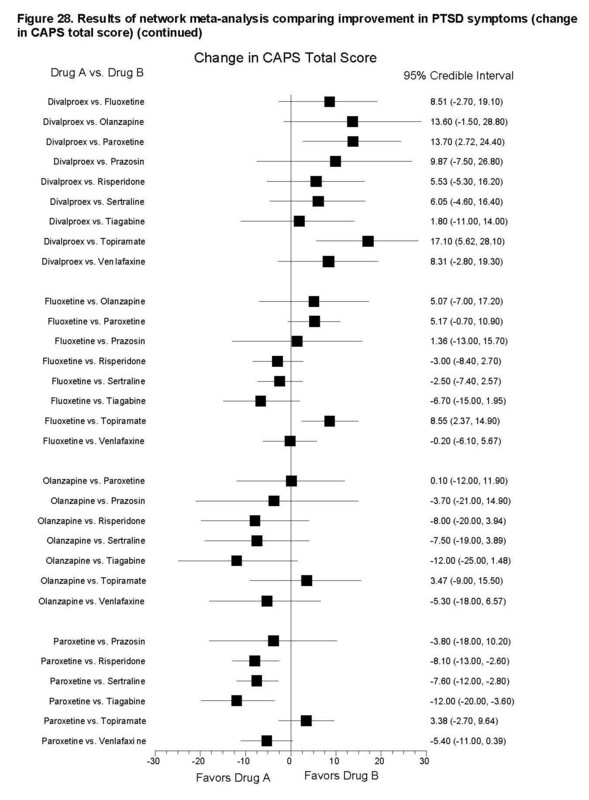 Fluoxetine versus placebo in posttraumatic stress disorder. J Clin Psychiatry. 2002 Mar;63(3):199-206. 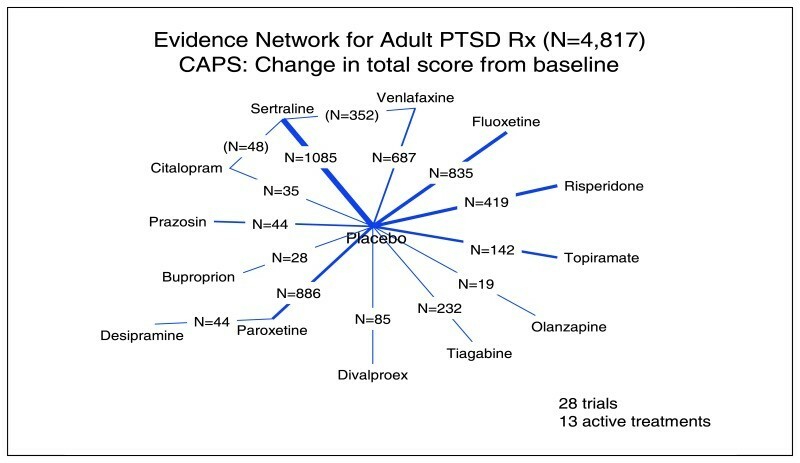 Martenyi F, Soldatenkova V. Fluoxetine in the acute treatment and relapse prevention of combat-related post-traumatic stress disorder: Analysis of the veteran group of a placebo-controlled, randomized clinical trial. Eur Neuropsychopharmacol. 2006 Jul;16(5):340-9. Martenyi F, Brown EB, Caldwell CD. Failed efficacy of fluoxetine in the treatment of posttraumatic stress disorder: results of a fixed-dose, placebo-controlled study. J Clin Psychopharmacol. 2007 Apr;27(2):166-70.van der Kolk BA, Dreyfuss D, Michaels M, et al. Fluoxetine in posttraumatic stress disorder. J Clin Psychiatry.1994 Dec;55(12):517-22.
van der Kolk BA, Spinazzola J, Blaustein ME, et al. A randomized clinical trial of eye movement desensitization and reprocessing (EMDR), fluoxetine, and pill placebo in the treatment of posttraumatic stress disorder: treatment effects and long-term maintenance. J Clin Psychiatry. 2007 Jan;68(1):37-46. Brady K, Pearlstein T, Asnis GM, et al. Efficacy and safety of sertraline treatment of posttraumatic stress disorder: a randomized controlled trial. JAMA. 2000 Apr 12;283(14):1837-44. Brady KT, Sonne S, Anton RF, et al. Sertraline in the treatment of co-occurring alcohol dependence and posttraumatic stress disorder. Alcohol Clin Exp Res. 2005 Mar;29(3):395-401. Davidson JR, Rothbaum BO, van der Kolk BA, et al. Multicenter, double-blind comparison of sertraline and placebo in the treatment of posttraumatic stress disorder. Arch Gen Psychiatry. 2001 May;58(5):485-92. Friedman MJ, Marmar CR, Baker DG, et al. Randomized, double-blind comparison of sertraline and placebo for posttraumatic stress disorder in a Department of Veterans Affairs setting. J Clin Psychiatry. 2007 May;68(5):711-20. Panahi Y, Moghaddam BR, Sahebkar A, et al. A randomized, double-blind, placebo-controlled trial on the efficacy and tolerability of sertraline in Iranian veterans with post-traumatic stress disorder. Psychol Med. 2011 Oct;41(10):2159-66. Zohar J, Amital D, Miodownik C, et al. Double-blind placebo-controlled pilot study of sertraline in military veterans with posttraumatic stress disorder. J Clin Psychopharmacol. 2002 Apr;22(2):190-5. Tucker P, Potter-Kimball R, Wyatt DB, et al. 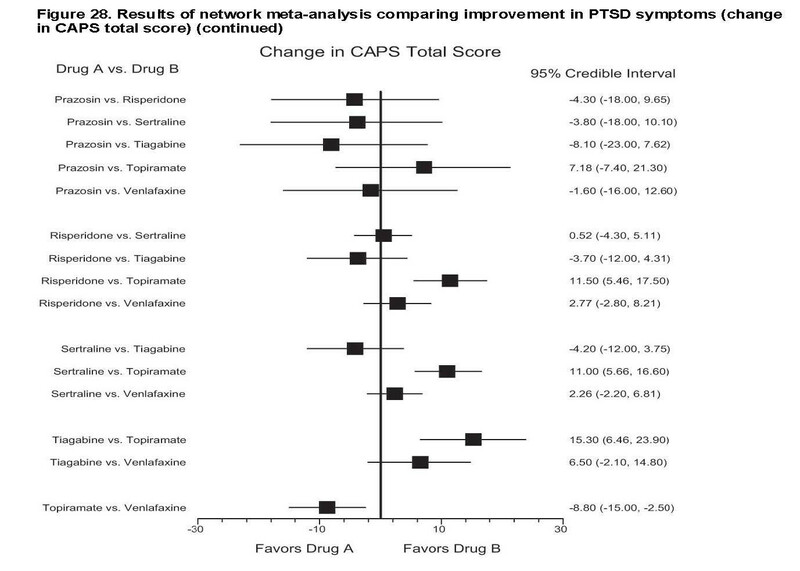 Can physiologic assessment and side effects tease out differences in PTSD trials? 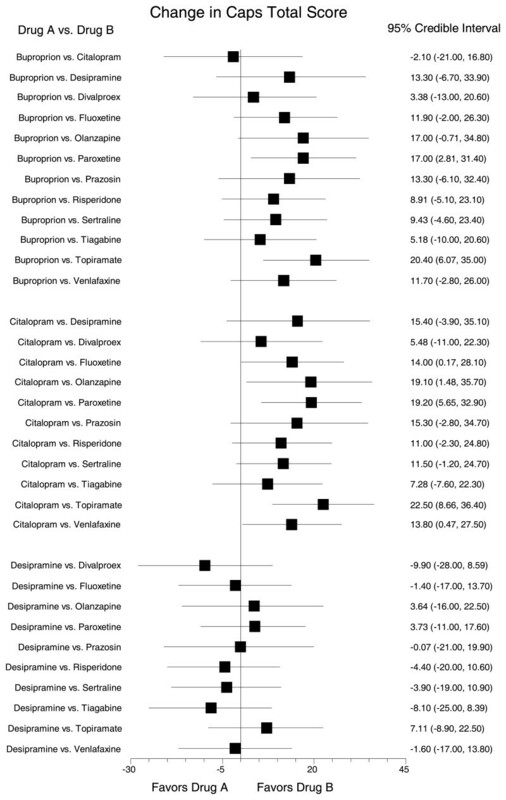 A double-blind comparison of citalopram, sertraline, and placebo. Psychopharmacol Bull. 2003 Summer;37(3):135-49. Tucker P, Ruwe WD, Masters B, et al. Neuroimmune and cortisol changes in selective serotonin reuptake inhibitor and placebo treatment of chronic posttraumatic stress disorder. Biol Psychiatry. 2004 Jul 15;56(2):121-8. Davidson J, Rothbaum BO, Tucker P, et al. Venlafaxine extended release in posttraumatic stress disorder: a sertraline- and placebo-controlled study. J Clin Psychopharmacol. 2006 Jun;26(3):259-67. Davidson J, Baldwin D, Stein DJ, et al. Treatment of posttraumatic stress disorder with venlafaxine extended release: a 6-month randomized controlled triale. Arch Gen Psychiatry. 2006 Oct;63(10):1158-65. Tucker P, Trautman RP, Wyatt DB, et al. Efficacy and safety of topiramate monotherapy in civilian posttraumatic stress disorder: a randomized, double-blind, placebo-controlled study. J Clin Psychiatry.2007 Feb;68(2):201-6. Lindley SE, Carlson EB, Hill K. A randomized, double-blind, placebo-controlled trial of augmentation topiramate for chronic combat-related posttraumatic stress disorder. J Clin Psychopharmacol. 2007 Dec;27(6):677-81. Yeh MS, Mari JJ, Costa MC, et al. A double-blind randomized controlled trial to study the efficacy of topiramate in a civilian sample of PTSD. CNS Neurosci Ther. 2011 Oct;17(5):305-10.